McFarland Designs - Ethical Jewelry Using Fair Trade Stones and Recycled Metal: Food. I've made some yummy, easy food lately but I was too lazy to go find my camera so sorry, no pics. Last night, I made very simple rocky road-inspired sundaes for me and Matt - I started with chocolate fudge Tempt ice cream (hemp based, and very good) and added chopped chocolate-covered almonds and chopped Dandies marshmallows. While the spaghetti is cooking, combine margarine and pine nuts in a small pot and cook over medium heat, stirring regularly, until both margarine and nuts are browned. Chiffonade the basil and set aside. After pasta is cooked and drained, return it to its cooking pot and stir in the margarine/pine nut mixture and the nutritional yeast. Spoon into individual bowls, top with basil and red pepper flakes, and enjoy! 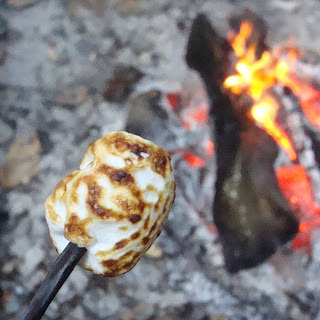 Oh wait, I just remembered that I do have one food photo to share... a yummy toasted Dandies marshmallow from our camping trip earlier this week. Yum!